Over the past two decades, China has expanded its transplant medicine performing in excess of 10,000 transplants a year. Historically, executed prisoners comprised over 90% of all organ “donors,” violating international guidelines set by the World Medical Association, World Health Organization and The Transplantation Society. China announced it would end organ harvesting from executed prisoners by January 2015, but failed to address organ harvesting from prisoners of conscience. It did state that the recently established public organ donation system would cover the loss of the prisoner based organ source. This study examines the most current officially reported transplant numbers and evaluates this data in the context of individual hospital statements. Over the past two decades, China expanded its transplantation medicine from organ procurement of executed prisoners to organ sourcing from, what officials claim, is a public organ donation system. In contrast to other countries that publicize numbers of transplants performed by each transplant center separately, China reports only nationwide transplant numbers. As a result, transparency is limited and the possibility of garnering specific numbers is next to impossible. Discrepancies between national numbers and individual hospital rates raise grave concerns regarding the veracity of China’s officially reported nationwide transplant numbers. China announced it would end organ harvesting from executed prisoners by January 2015, yet failed to mention organ harvesting from prisoners of conscience. Therefore, questions arise regarding the number of organs being procured and their actual source. These questions were recently brought to center stage when the WOIPFG reported a phone call with a doctor from China who indicated that “countless” Falun Gong practitioners were killed for their organs. Unlike other countries, officially reported transplant numbers from China are presented in an atypical and apparently artificial manner. Former Vice Minister of Health, Huang Jiefu, presented official liver and kidney transplant numbers at the 2010 transplant conference in Madrid, Spain. Based on these numbers, transplants doubled from 2003 to 2004, peaking at 12,265. Such a sudden increase within one year, followed by a gradual decrease, is unusual as it is unclear where the extra organs came from in 2004. If a new source of organs was available, the transplant numbers should reflect stability at a similar level. This pattern of sudden increase has not been seen in other countries. There was a total of 59,500 liver and kidney transplants between 2003 and 2008, in a country that had performed only a few hundred transplants by the end of the 20th century. In the absence of an organ donation system during those years, central questions arise: Where did the excess organs come from? Did international attention, triggered by the Bloody Harvest report in 2006, and the Olympic Games in 2008, contribute to the marked decline after the peak in 2004? Similar and apparently artificial transplant figures are shown in the number of living donor transplantations. In 2010, Huang Jiefu presented the numbers of kidney transplants from living donors. Before 2006, the living donor numbers were low. Then, within one year, the number of living donor kidney transplantations jumped from 300 in 2006, to 1,720 in 2007, a steep increase of approximately 470%, followed by a smaller increase in 2008 with a plateau of 0% growth from 2008 to 2009. China’s sudden steep increase of living kidney donations by 470% in one year would be implausible and unprecedented in any other country. Also, during that time period China did not have a public organ donation system. If this increase was the beginning of a growing awareness to donate organs after educating the public, etc., one would expect further increases in the following years, i.e., 2008 and 2009. It is implausible that China would have opened the potential for living kidney donations in 2007 and reached its end in 2008/2009. The comparison of a 470% increase and a 0% increase within two years suggests that the numbers are artificial. 1.3) China launched its new public organ donation system in 2013 and claimed to have 2,866 deceased citizens who donated their organs, and that they were able to perform 7,667 transplantations by 2015. In comparison, it took many years for other countries to build voluntary organ donation systems. A public organ donation system based on voluntary, altruistic organ donation requires informing and educating the public and building trust over time as there is a natural delay between registration and donor death when the organ is actually available. Therefore, the donation numbers of China’s newly established system appear artificial and have never been seen in other countries. 1.4) The artificial characteristics of official transplant numbers in China are even more obvious in the context of organ donation numbers on the website of the Red Cross Society of China which publishes numbers of registered donors, organ donors and transplants. According to the Red Cross Society’s website, within one day, between December 30, 2015[i] and December 31, 2015[ii] the number of registered organ donors increased by exactly 25,000, from 40,322 to 65,322 registered donors. 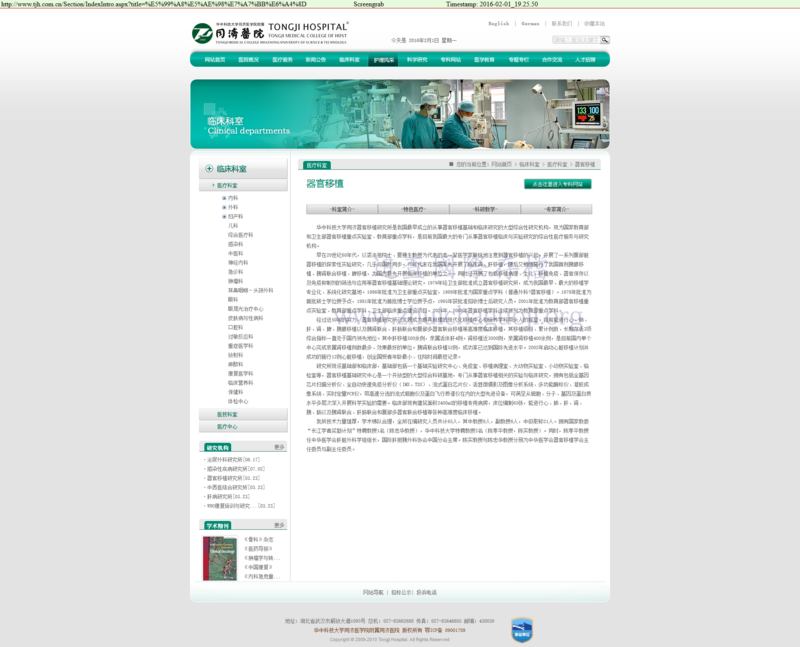 1.5) The official website of the Beijing University People’s Hospital stated in 2014 that the hospital performed 120-130 liver and kidney transplants per year. Yet, in September 2013, Dr. Zhu, director of the Department for Hepatobiliary Surgery at the Organ Transplantation Institute of Peking University, said in an interview in the China Economic Weekly, “Before 2010, almost all organs for the transplants at our hospital came from executed prisoners. We have done 4,000 cases of liver and kidney transplant within one year. These organs came all from death row inmates.” This is exemplary of the pattern of discrepancy between officially reported and actual transplant numbers. Summary: It is imperative to reassess the transplant numbers provided by Chinese officials when questions arise due to inconsistent and implausible findings. China’s officially reported transplant numbers are spurious. The actual numbers would likely be different, i.e., either well above, or below the officially reported numbers. 2.1) Many Chinese hospitals have reported performing thousands of transplants a year. In September 2013, Dr. Zhu J. of the Beijing University People’s Hospital told Chinese media that his hospital carried out 4,000 liver and kidney transplants within one year. Based on the analysis of WOIPFG, the hospital mentioned by Mr. Suzuki would be the First Hospital of China Medical University. 2.2) The infrastructure of China’s transplant centers has dramatically expanded in the last 15 years. The officially endorsed primary organ source during this time period was the executed prisoners group. There was no public organ donation system in place. The Chinese government did not provide any information about any other noteworthy, operational organ sources. Yet, hospitals have invested in the transplant infrastructure and expanded the number of beds in transplant hospitals. The Tianjin First Central Hospital invested US$20 million in 2003 to build a 17-story transplant facility. During the period 2015 to 2017, the hospital plans further expansion with a US$426 million investment. In 2009, the hospital floor plan showed “450 beds” used for transplants. The hospital stated that the “kidney and liver transplantation beds are at 90 percent utilization,” throughout the year. Provided that a new transplant recipient stays 30 days inpatient, this hospital alone would perform about 5,000 transplants per year, which would cover half of the officially reported annual transplant numbers for all of China. The following two tables illustrate that the combination of the official transplant numbers and the numbers of transplant centers are a statistical stretch. The second table below shows combinations of licensed and capable transplant hospitals and assumed annual transplant numbers. It is less likely that each of the licensed transplant hospitals perform only 50 transplants per year, and rather that each of the transplant capable hospitals performs 200 transplants per year. But it seems realistic that each of the licensed centers can perform on average—at least—200 transplants per year, or that the transplant capable hospitals perform on average about 50 transplants per year. In both latter cases this would result in about 30,000 transplants per year. 2.2.3) The number of transplantations performed is also reflected in the financial revenue of the centers. Aside from investments in the transplant infrastructure, as shown in the case of the Tianjin First Central Hospital, a look at the total revenue also indicates the growth of a lucrative transplant market. The PLA No. 309 Hospital’s Organ Transplant Center Overview of November 17, 2010, shows that the facility’s total revenue through transplantations increased from 30 million RMB in 2006 to 230 million RMB in 2010. This indicates an eight-fold increase in the revenue from transplantation surgeries within 4 years. It is reasonable to assume that this growth can be interpreted as a reflection of an increased number of transplants at this single hospital. A scrutiny of other transplant centers may reveal a similar trend of revenue increases and adds to the discrepancy in officially reported numbers. China reports that the annual transplant numbers have been steady—holding at about 10,000 transplants per year—for the past 12 years. Yet, transplant centers report multi-fold increases in gross income from transplantation surgeries and invest largely in the expansion. This is a discrepant development. 2.3) Despite domestic organ shortages, China has an active transplant tourism market. Patients from Taiwan, Malaysia, Japan, the United Kingdom, the United States, Italy, Russia, Arabic countries, and other countries, travel to China for fast track transplants. Although there are more than 100,000 Chinese citizens on the waiting list, foreign patients receive priority and there are apparently sufficient organs readily available. In December 2014, the son of a Malaysian sultan received a liver transplant in China within four weeks of his request. Desperate patients seek out and arrange for transplants in China through the Internet. According to eye witness accounts, there is a growing trend with transplant patients being offered a 10% recruitment discount for steering other patients to transplant brokers in China. This shift from the typical “organ broker” pattern to a “transplant recipient becomes organ broker among peers” pattern also makes it more difficult to keep track of the actual transplant tourism numbers. This surgeon stated that more than 60,000 organ donors did not come from the pool of the executed prisoners, but came from an undisclosed pool of donors, where counterfeiting the identity of the organ source was required. This raises a consideration: If just one senior military doctor witnessed so many counterfeit forms, how many more have occurred in other regions as well? • There are 165 licensed transplant centers, and overall more than 600 hospitals that are capable of performing transplants in China. • The rapid growth of the transplant infrastructure reflects an underlying confidence in the future abundance of available transplant organs. • Dramatic increases in transplant centers’ revenues suggest a steep increase in the number of transplants. • In Tab.2, the 30,000 transplants per year represent the lower end number. If the transplant numbers of the top ten transplant hospitals were combined, starting with the Tianjin First Central Hospital and the Beijing University People’s Hospital, the total would immediately exceed the officially reported annual national figure of about 10,000 transplants. The large number of transplants performed in China is dependent on a ready and reliable source of available and acceptable organs. The public organ donation system introduced in 2013 reported a significant yield of organs for 2015 only. This newly established voluntary system cannot explain the large number of organs used for transplantations prior to 2015. Chinese officials have admitted that the vast majority of transplanted organs have come from prisoners. The official explanation holds that the organs come from “executed prisoners.” Amnesty international and the Dui Hua Foundation estimate 2,000-3,000 executions per year in China, perhaps explaining only 6,000-9,000 transplants. However, the prevalence of infectious and other diseases among the convicted prisoner group, including other factors such as age, tobacco, drug and alcohol abuse make it highly unlikely that all death row candidates would even qualify as organ donors. Thus, the number of organs that could be procured from executed prisoners that qualify for transplantation must be only a fraction of the aforementioned estimated figure, making the gap of unexplained, undisclosed organ sources even larger. In addition, there are ethical concerns regarding the procedure of giving consent. International standards state that prisoners, deprived of their freedom, are not in the position to give free, voluntary consent. Nevertheless, the possibility of voluntary consent versus use of coercion among prisoners in China was explored. One might assume that the willingness to donate organs would be the same for all Chinese people, regardless of whether they are free or in prison, and that the organ donation rates would be the same. If the voluntary organ donation rate in the “free” population of China was less than 1 per million population before 2015  , one might assume that the controversial voluntary organ donation rate among death row prisoners would also be close to 1 per million. For example, if there were 10,000 executions per year, statistically there would not be even one candidate willing to donate his/her organs. If we apply the average donor rate of the Chinese population, it cannot explain the large transplant numbers officially reported by Chinese officials (especially considering that not all donated organs would be viable). If the “consent rate” among death row prisoners approaches 100%, it would raise the issue of voluntary consent versus coerced participation. If one applies the average consent rate of the Chinese population to the death row prisoners group, then the numbers do not add up. The next available source for such a large number of on demand, rapidly supplied matching organs would be prisoners of conscience. The group of prisoners in China’s vast detention system was explored. 3.3.1) UN Special Rapporteur on torture, Manfred Nowak, reported after his mission to China in 2006, that Falun Gong was the largest group of torture victims (66%), followed by Uighurs (11%) then by Tibetans (6%). All three groups identified by the UN are reportedly victims of forced organ harvesting. While the report numbers reflect the extent of victim torture, they also indicate the potential risk for being subject to illegal organ harvesting. It is reasonable to conclude that someone who is subject to torture, where respect for individual human dignity is already lost, could also be subject to forced organ harvesting. It seems less likely that those not subjected to torture would become victims. The UN report suggests that the Falun Gong would have a 6 to10 times higher risk of being subjected to forced organ harvesting than Uighurs or Tibetans. 3.3.2) When comparing the size of the populations there are about 7.8 million Tibetans living in the Tibetan autonomous region and an estimated 15 million Uighurs living in Xinjiang province. There are about 70-100 million Falun Gong practitioners in all of China. The size of the persecuted population would support the observations made by UN Special Rapporteur, Manfred Nowak, when reporting on the torture victims in Chinese detention camps. Among the group of prisoners of conscience, Falun Gong is by far in greater numbers the largest victim group, making it statistically most likely to be subjected to forced organ harvesting. 3.3.3) In 1999, the Chinese leadership implemented the 610 Office, a Gestapo-like secretive network with extra-legal power having the sole objective of persecuting Falun Gong. The 610 Office operates throughout China. There seems to be no equivalent nationwide secret police group that targets Uighurs or Tibetans. While the later groups also suffer from severe persecution, it is limited to regional forms. Falun Gong is the only group that is targeted nationwide, and constitutes the overwhelming majority of incarcerated prisoners of conscience. 3.3.4) Falun Gong is a spiritual cultivation practice that aims to improve mental and physical health. In 1998, officials from the Chinese sports ministry stated that each Falun Gong practitioner saved the state about US$100 per year. Falun Gong practitioners do not smoke, do not drink alcohol, do not take drugs, are less exposed to certain infectious diseases, exercise the body daily and have a healthy life style based on moral values. Taking all of these factors into consideration, Falun Gong practitioners are likely healthier than the general population making them a more valued and exposed source for transplant organs. 3.3.5) There are various reports from phone conversations involving Chinese doctors that disclose the use of organs from Falun Gong practitioners. In 2006, a doctor admitted that at his military hospital the organs they used for transplant were harvested from Falun Gong practitioners. David Kilgour, David Matas, and the WOIPFG have collected a large number of similar phone conversations and admissions. Therefore, this does not represent occasional or coincidental cases, but rather a systematic and widespread use of organs from Falun Gong practitioners. 3.3.6) In 2014 DAFOH published a case study that revealed consistent reports of implausible medical tests and exams in Chinese detention camps. Reports by Falun Gong practitioners, as well as non-Falun Gong inmates and detained criminals, confirmed that it was almost exclusively the detained Falun Gong who were subjected to these medical tests and exams. Medical exams are costly, in particular when they are performed several thousand times. It is unprecedented that prison camps would have the budget to perform such widespread medical exams or that prison camp directors would allocate such a large investment on medical tests. While single eyewitness accounts may be insufficient, thousands of consistent reports from Falun Gong inmates cannot be ignored. The DAFOH study found several thousand reports, some reflecting hundreds of medical exams in individual detention camps. This equates to an extremely large investment of money spent on a large number of Falun Gong practitioners. Other prisoner groups are not reportedly targeted to this extent. Summary: The network to procure organs from prisoners of conscience must have an organized infrastructure with a systematic and consistent rapid access to a steady source of healthy, tissue matched organs in order to accommodate transplant tourists within 2-4 weeks, or with prescheduled surgery appointments. The only group that is large enough and subjected to such a mechanism of systematic persecution nationwide is Falun Gong. Taking the aforementioned aspects into consideration, this study confirms that Falun Gong prisoners of conscience are the largest group exploited for their organs and are at the highest risk to be the source of organs for the transplant numbers as outlined (under section 2 above). DAFOH holds the position that China runs a huge transplant market, far larger than publicly discussed, and that the majority of the organs needed to maintain such a market come primarily from Falun Gong practitioners. This study suggests that in the past ten years China has performed at least 30,000 transplants per year. Until recently, there was no operational organ allocation system in place in China. While in many countries an average of 2.75 organs per donor is documented, the number in China is lower. The “organ-on-demand” pattern practiced in China, without an effective organ allocation system and wait list—until recently announced—must go along with the wasting of organs. • One organ source contributes only 1-2 organs. • A maximum of 10,000 transplant organs stem from executed prisoners. • 10,000-20,000 organs have been harvested from at least 10,000 Falun Gong practitioners annually. DAFOH holds the position that since 2000 at least 100,000-200,000 Falun Gong practitioners must have been systematically killed for their organs. In most countries, transplant hospitals publish their own annual transplant numbers. This is not the case in China. Chinese officials provide only an annual, all-inclusive “national” transplant figure. If the transplant numbers of each transplant hospital were publicly accessible, it would reveal a true number of transplants taking place in China. This analysis suggests that China intentionally avoids publishing such numbers in order to prevent scrutiny. Therefore, the international community should request that China make transparent the transplant numbers of each transplant hospital individually. China’s transplant tourism industry is hugely profitable and provides organs within 2-4 weeks for patients from different countries around the world. Procuring matching organs on this large scale within such a short period of time requires systematic preparations, including a large, easily accessible organ donor pool. So called “black markets” lack the infrastructure to provide matching organs on this large scale within this rapid, made-to-order time frame. Black markets cannot plausibly explain the large transplant numbers in China. Thus, attempts by the Chinese government to shift responsibility to the black markets are implausible.